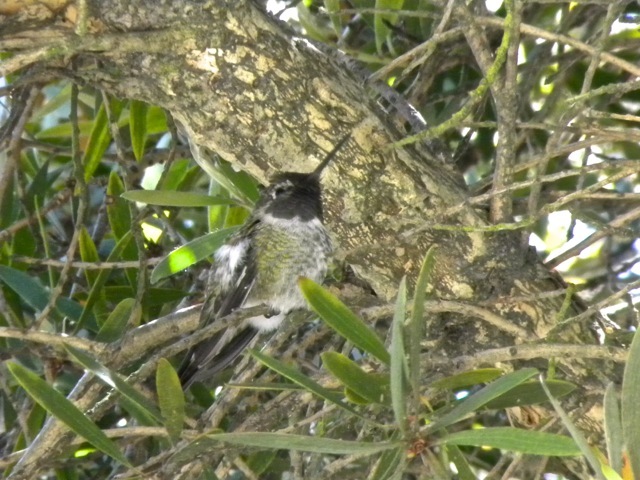 Sally and I saw our first hummingbirds in our son and daughter-in-law’s backyard in San Francisco. These tiny birds perch on their favorite branches for minutes before darting off like greased lightening. I took pictures of them and was amazed by how brilliantly colorful they are. 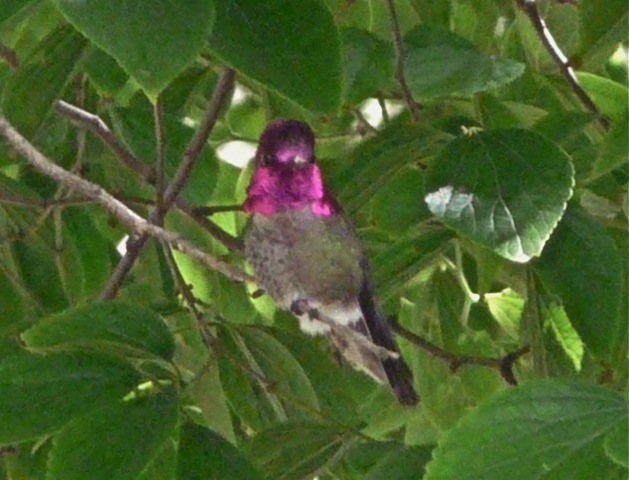 I read and found that there are some 350 species of hummingbirds and they only live in the Americas. Most of them live in Central and South America, and most do not migrate. Those that migrate would fly thousands of miles, sometimes over long stretches of ocean. Hummingbirds are tiny. 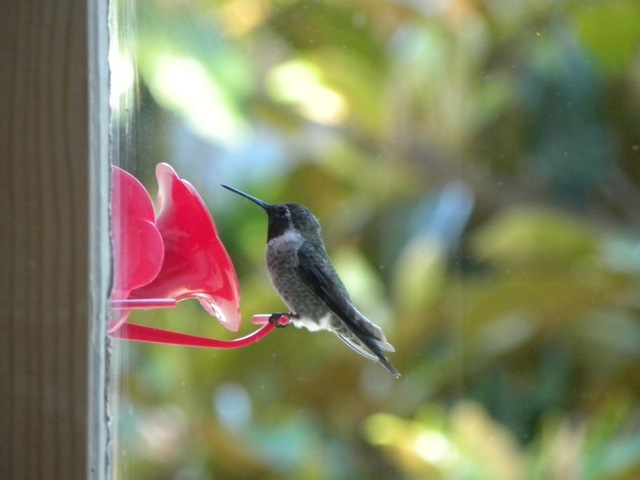 The ones we see in San Francisco are mostly Anna’s Hummingbirds, and they are only 3 inches in length. 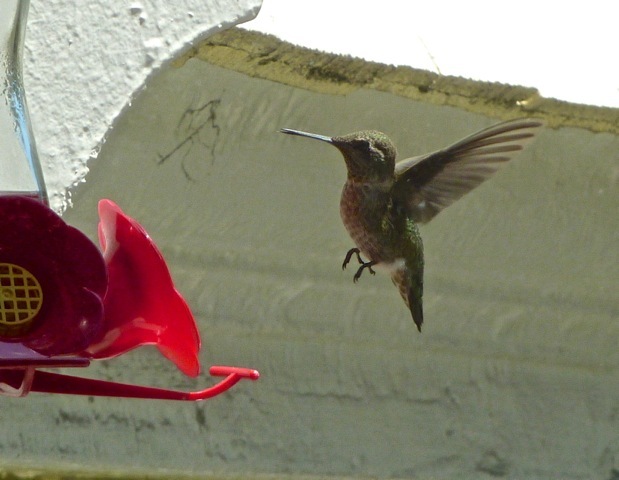 The most amazing thing about the hummingbirds is their ability to hover in mid air, flapping their wings at 50 beat per second. 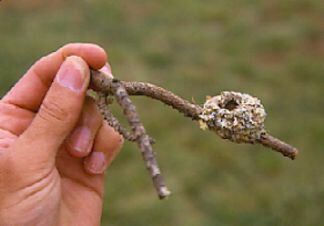 The female hummingbird would build nests with pilfered spider web silk, and hatch tiny chicks. This is the size of their nests. 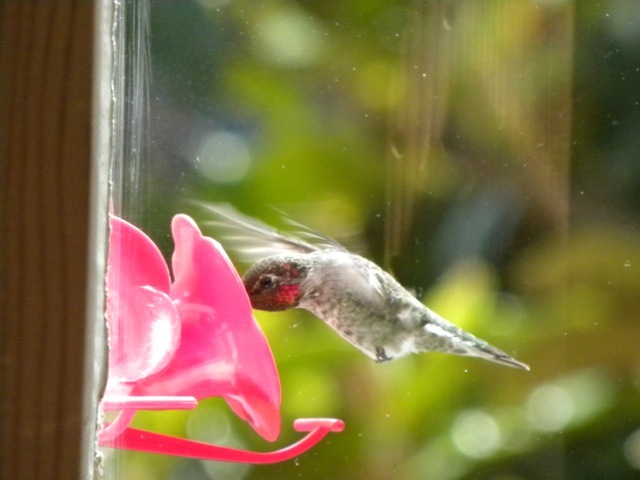 To attract hummingbirds, I installed a feeder filled with sugar water outside our living room window. Visitors came to drink, but they soon disappeared. Upon inspection, I noticed some mold inside the feeder which turned off the birds. Now, I sterilize the bottle every three days, and the birds visit often. We began to identify the visitors. This slender darling is named Tiny. This is Chubby for obvious reasons. This one with shiny green feather is called Greenback. And this one with a red head is named Red. For awhile, we called these the Gang of Four (四人幫). As we watched them often, we began to notice some interesting behavioral antics. When they drink, they stay alert and would lift their heads every few seconds. As they lift their heads, they would flick out their tiny tongues, as if they were still licking nectar. This bird opened its beak a little and flicked its tongue, while it was in flight. The birds are extremely agile. They can turn on a dime and take off like an arrow. 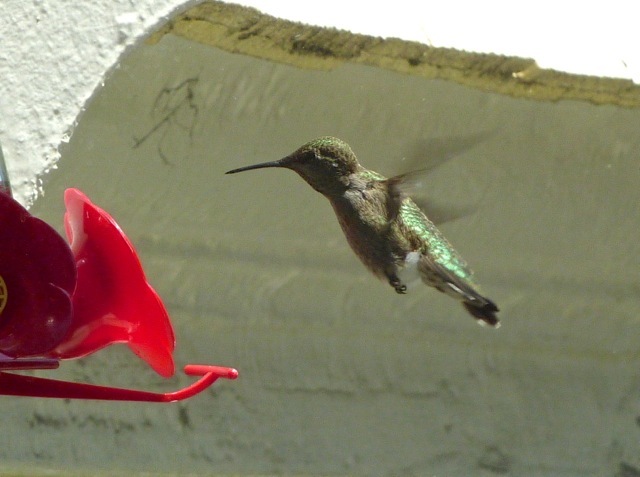 Hummingbirds could fly upside down as well as backwards for short distances. They accelerate and decelerate without any buffer zone. They are gold medal acrobats on the wings. 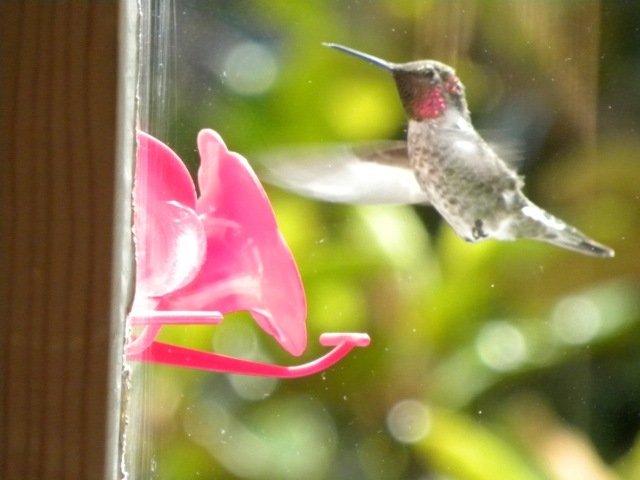 Hummingbirds drink nectars five to ten times an hour. The sugar gives them the energy to fly and to maintain their extremely rapid metabolism. Their tiny hearts beat as fast as 1,000 beats per minute. They eat small insects such as spiders for protein and nourishment. 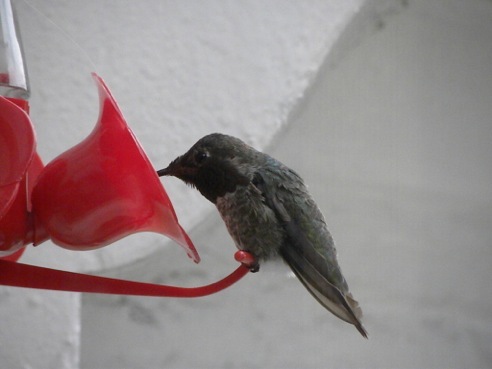 We noticed differences in our hummingbirds’ behavior. 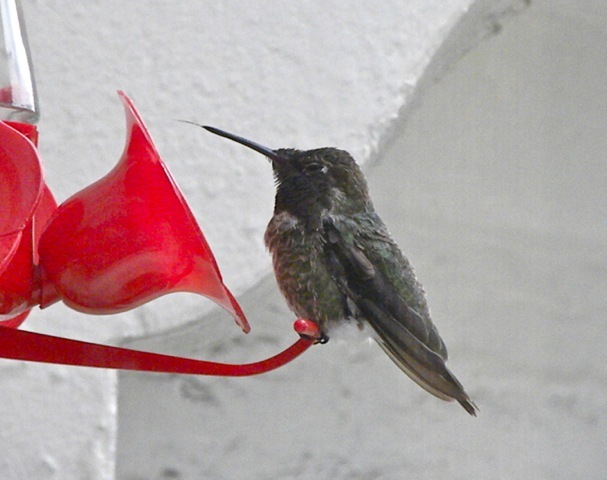 Tiny is an even tempered darling and would perch quietly on the feeder to drink at leisure. Nothing seems to bother it. Once, it drank 15 times in 30 seconds. By contrast, Red is a nervous wreck. It would flap its wings furiously, hovering by the feeder and would not land on the perch. 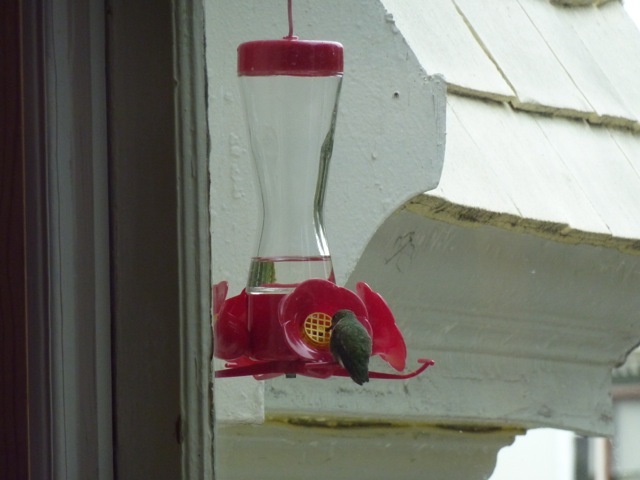 It dips its beak into the feeder to drink a couple times before zipping off. For us to catch it in pictures, we have to be very alert and quick with our camera. Once, I was standing by the window when Tiny hovered nearby. 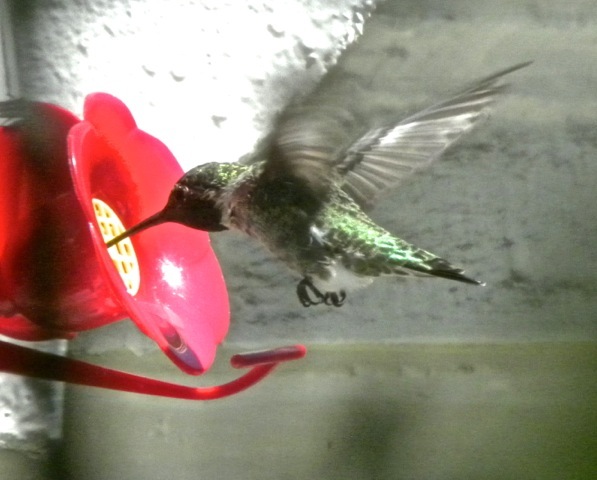 Then it flew toward me and landed on the feeder to drink. I froze and watch it drink for 20 seconds, one foot away from me. Periodically, it raised its head and looked at me with its bright black eyes. That was a close encounter of a joyous kind. We have difficulties identifying individual birds with certainty. Sometimes we think we are seeing one bird with different colors and calling the same bird by different names. Upon research, I find out their feathers show colors by iridescence. The colors are not from pigments in the feather, but by selective diffraction of light from a microscopic layer of bubbles on the surface of their feathers. Depending on the angles of incident light and observation, a metallic color would be observed. 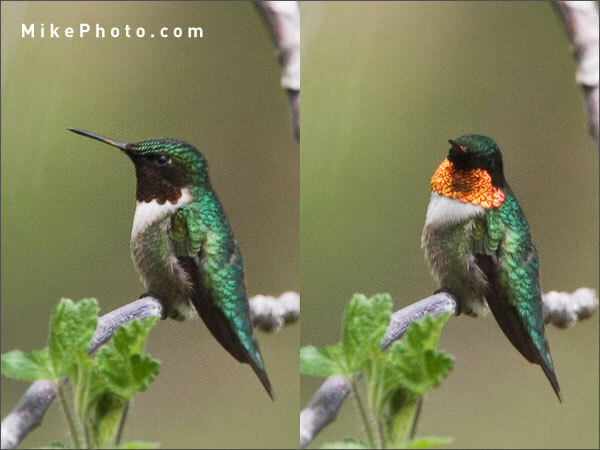 The photos below show how the same feathers on a bird would change instantly from black to orange as it turns its head. 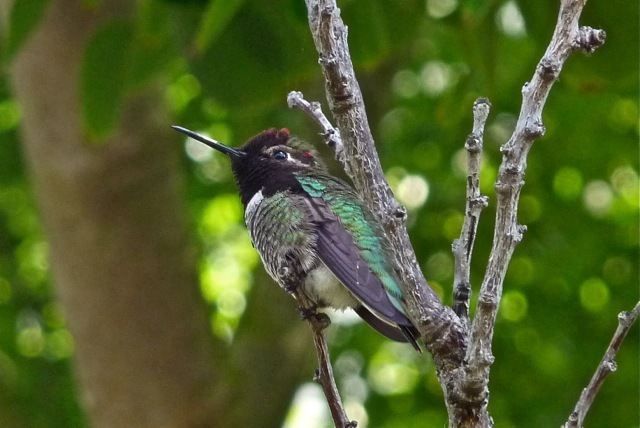 Hummingbirds are notoriously territorial and would fiercely defend its turf from other hummingbirds. 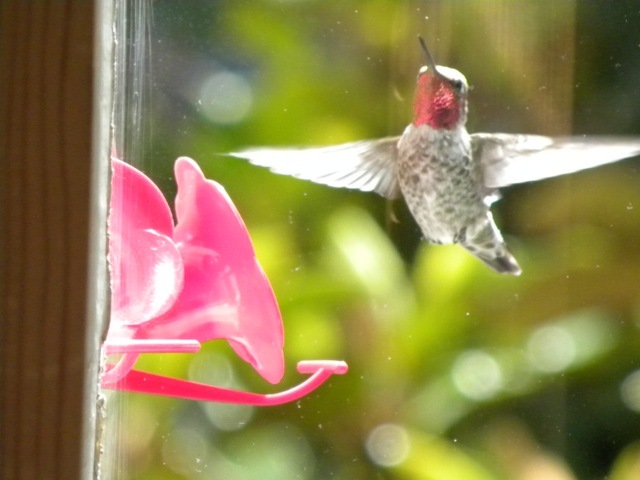 Sometimes we would see two hummingbirds chase each other, hurtling through the air. In the last few days, we have fewer visitors to our feeder. 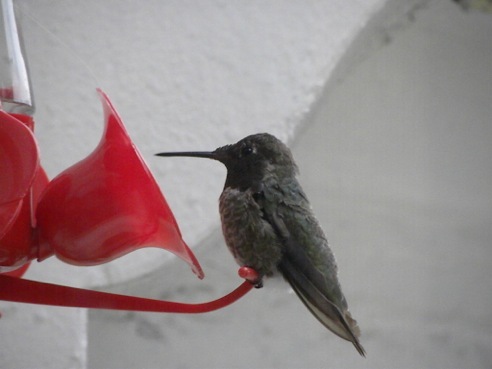 Then we noticed our feeder has been claimed by one hummingbird, Red, as its personal dining table; and it chases other birds from it. Sitting on our sofa, we look out of our windows and see the whole drama unfold. 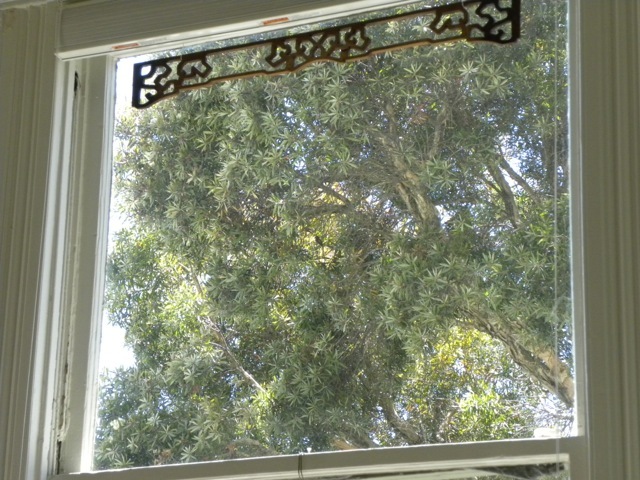 The feeder is hanging on the edge of the left window, at lower left corner of the picture. Red is perched in the tree at upper right corner of the picture, barely twenty feet from the feeder. Red would stake out the feeder for 20 minutes at a time, and would swoop down on any stray hummingbird that approaches the feeder. 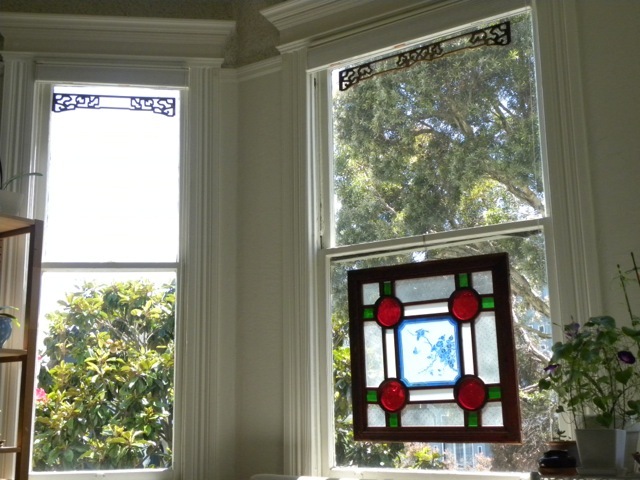 When they zip by our windows, we see tiny streaks in our peripheral vision but cannot discern the shape of the birds. Red is in the middle of the window, amidst the patch of sunlit leaves. Looking at Red from below, it appears to be dull grey with black feather on its head. When viewed from the side, Red’s body shines in brilliant green. When Red is in the sun and viewed at the correct angle, its head and throat are covered in shiny red. They are our flying jewelry. 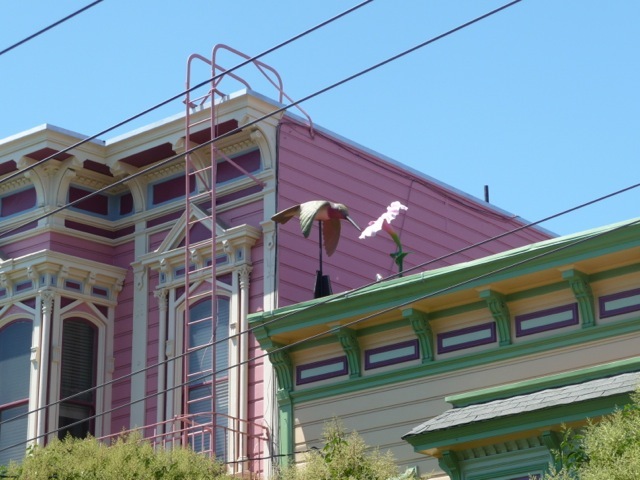 One neighbor’s house has a gigantic hummingbird and flower on the roof. 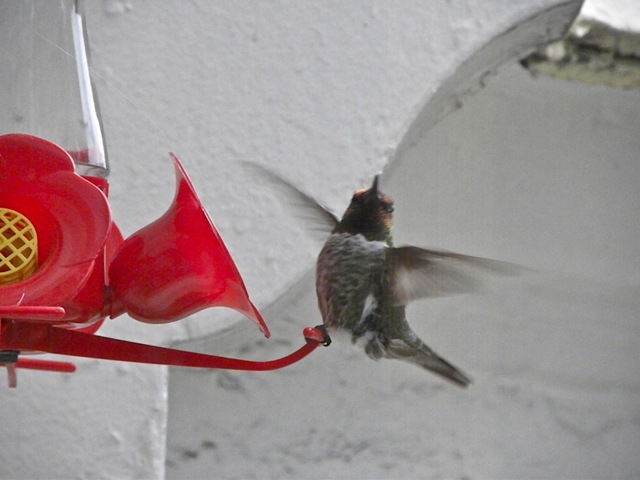 San Franciscans love our hummingbirds, for sure. Posted by Robert Wu on Wednesday, October 10, 2012, at 6:05 am. Filed under Uncategorized. Follow any responses to this post with its comments RSS feed. You can post a comment or trackback from your blog.